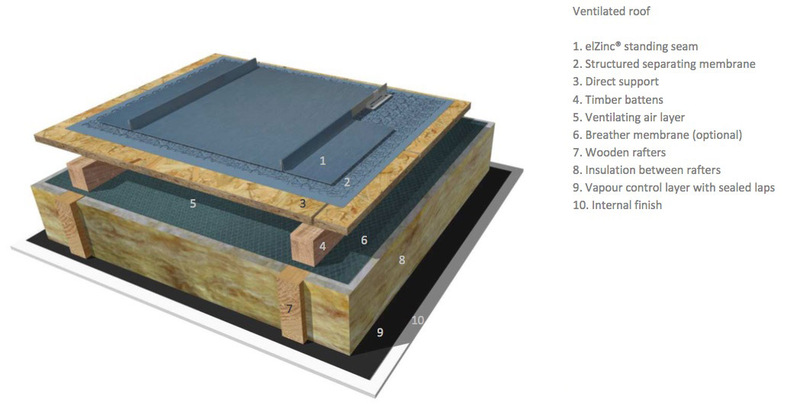 Following on from our Introduction to Standing Seam Zinc Roofing Design, the team at elZinc® look at three typical roof build-ups for standing seam zinc roof construction. Don’t forget to subscribe to receive the other posts in this series. Standing seam trays are not self- supporting and require a fully or almost fully supporting substrate against which they rest and to which their clips are fixed. 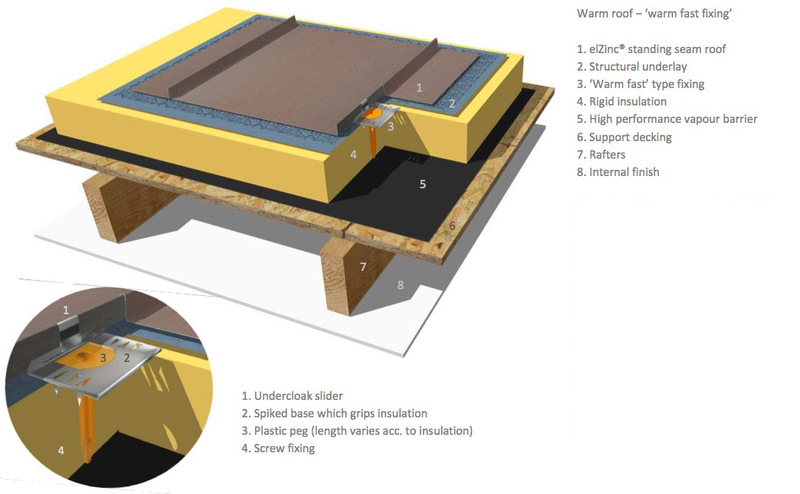 The substrate can be vented or unvented but it is essential that the roof build-up is correctly executed in either design to avoid the risk of interstitial condensation that could damage the roof. Contact us for design support for your roof. Timber is used for the substrate on ventilated roofs, in the form of soft-wood boarding, WBP exterior grade plywood sheathing or Class 3 OSB sheathing. The minimum thickness of the substrate is 22mm for the s/w boarding and 18mm for the plywood and OSB sheathing. These materials should be fixed perpendicular to the direction of the standing seams. If there are any doubts regarding the minimum clip pull-out values in the OSB sheathing, a test should be conducted to establish that the 560N minimum will be achieved with the proposed type of fastener. 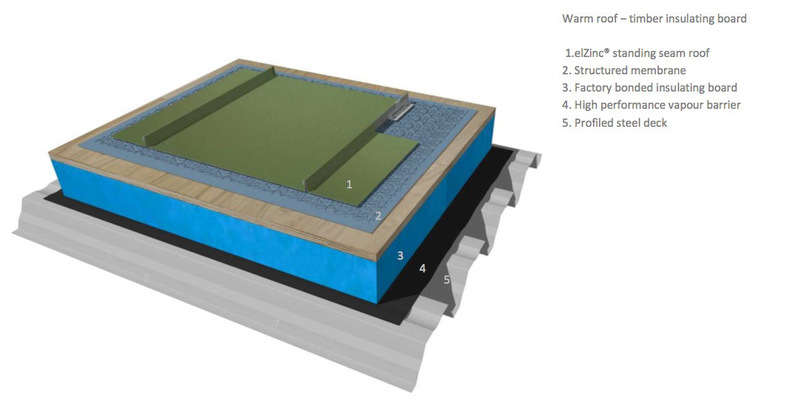 Warm zinc roof construction can also use timber substrates, but the need to reduce cold bridging in many countries has led to the use of rigid insulation boards and composite insulation boards or sandwich panels as the direct substrate under the zinc. Rigid insulation is used in combination with special clips that enable the zinc to be fixed to the supporting decking below, and used in this way it must be able to withstand foot traffic and the like, and not deform during the life-time of the building. Composite insulating boards provide a timber decking that is factory-bonded to the insulation, so the installation of the zinc is executed using traditional clips and fixings. Three examples of the many possibilities that exist are shown here. For more detailed information on these, and on other types of supporting materials and roof construction, please get in touch. ElZinc® Protect+® zinc sheets and strips, coated with a 60μm polyurethane-polyamide layer on their underside face, can be used as an additional measure to protect the underside of the zinc covering if there are doubts regarding the efficiency of the design to control condensation within the roof in all weather conditions. Please consult our technical advisory service for more information on when to use the Protect+® range of products. The height of the ventilating layer should be a minimum of 5cm, and in some cases (low pitch, long eaves to ridge measurement) should be increased to 10cm. The direct support can be open gap softwood boarding, or plywood or OSB sheathing, all laid parallel to the gutter, and staggered. The optional breather membrane provides additional protection for the insulation against cold wind- driven drafts that enter the ventilation gap from the outside. The factory bonded insulating board is screw fixed through the vapour barrier into the decking below. The high performance vapour barrier must self- seal against these fixings, and all laps and roof penetrations must be taped and sealed. The exterior face of the insulating board should be exterior grade plywood or class 3 OSB, at least 18mm thick. The performance of the vapour barrier is fundamental in this design. The high performance vapour barrier, whose effective function is fundamental in this design, must self-seal against the warm fast type fixings, and all laps and roof penetrations must be taped and sealed. The insulation should be rigid enough to withstand foot traffic and not deform in any way during its service life. The support decking can be timber or steel. Standard clip centres apply, but the zinc is fixed using one screw only per clip, so a sufficient pull-out value for the screw in the supporting decking (560N) should be ensured. Comment below or get in touch for more information on these roof buildups. 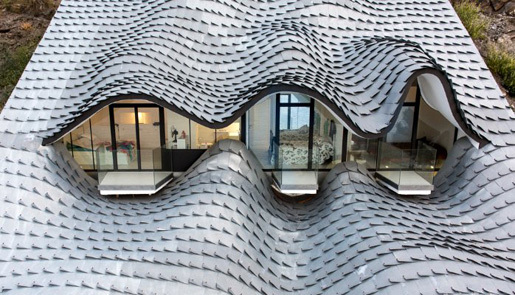 Contact us for help in designing your zinc roof – roof design is part of our 8 Steps Service. Read the introduction to standing seam in Part 1 of this series. In part 3 we look at four special roof shapes for standing seam zinc roofing and set out what you need to consider when designing domes, barrel vaults and conical roofs. Please subscribe here to make sure you don’t miss future blog posts. Note: The colours shown in this document are for illustrative purposes only and should not be taken as representative of the real finishes. Please request a sample card to see the real elZinc® finishes. I am limited to height so can I construct a cold flat roof or is this not advisable? You can construct a cold roof build-up when using zinc, but the absolute minimum pitch is 3 degrees, preferably 5 degrees.